Renowned scholars from the fields of film theory, communication studies, cultural studies, and new media theory explore the ways in which digital technology is transforming contemporary visual culture. Using Gene Youngblood's 1970 book Expanded Cinema as an anchor for the volume, Fluid Screens, Expanded Cinema understands the digital not simply as a technological form, but also as an experience of space and time that is tied to capitalism. This important collection is unique in framing a range of social justice issues with aesthetic theories of new digital screen culture that will appeal to scholars and multimedia artists prepared to break new ground. 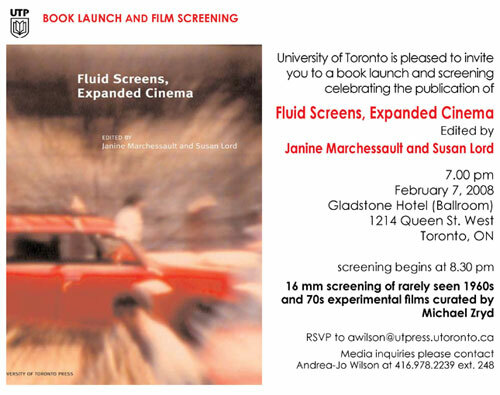 This short program of Canadian and US films from the late 1960s through the mid 1970s presents 16mm films that play with the metaphor of the fluid screen or embody the utopian historical moment of expanded cinema. David Rimmer’s Canadian Pacific is a double-screen projection, expanding cinema from its conventional rectangle. Rimmer’s Blue Movie was originally screened in a geodesic dome while Jordan Belson’s Allures was projected at planetariums. Paul Sharits experimented with early sculptural projections; Piece Mandala / End War is screened in homage. Joyce Wieland finds fluid frames within frames in Water Sark. The program concludes with Carolee Schneemann’s Viet-Flakes, an anti-war film she incorporated into her 1967 stage and electronic media performance, Snows.